Should old acquaintance be forgot, and never brought to mind? If we are talking about 2018 then yes. We are all about forgetting 2018 and looking gleefully at 2019. Beyond the markets, a few other things we are glad to see go: young adults eating Tide Pods, “flossing” and IHob. What else is brought to mind; King James joined the Lakers, Prince Harry got married, California burned and the Golden State Killer was found, Hawaii had a false missile alarm, Fortnite blew-up, and Banksy was shredding. Now on to what matters. During the year pundits opined about the Federal Reserve and their decision on interest rates. The Fed has two mandates, employment and inflation, the most common inflation measure being the Consumer Price Index (CPI). 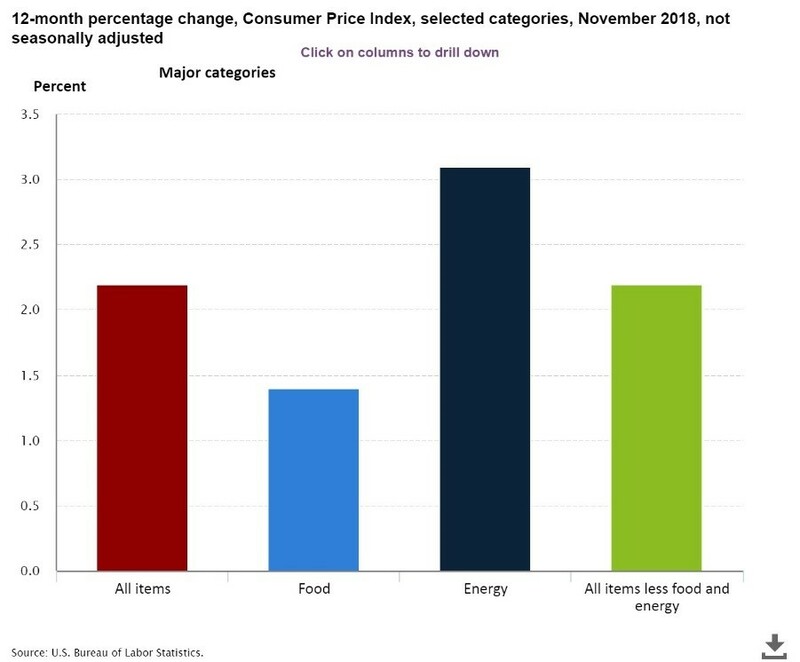 CPI tracks the prices on basket of goods and services and has received some changes over the years. In 1983, house prices were removed and “owner’s equivalent rent” was added. In 1998, hedonics was introduced to estimate a product’s value with increases in technology. And finally, in 1999 product substitution was introduced – steak too expensive, buy hamburger. These changes lead to debate on the true value of inflation, some believe inflation to be higher than the published rate. 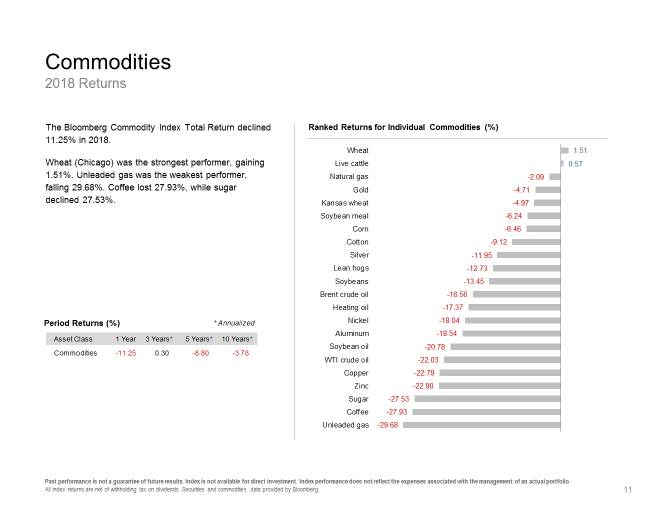 We believe there are additional factors keeping the rate low, not the least of which is falling commodity prices. Are you feeling like you have fewer choices? The New York Times reported that Altria, Reynolds America and Imperial have 92 percent market share of the cigarette and tobacco industry. Anheuser-Busch InBev, MillerCoors, and Costellation have 75 percent of the beer industry. Concentration can lead to something called “monopsony” power. This is where a large buyer controls the market and has the power to control suppliers and workers. If you control the workers, can’t you control the wages? Concentration can also reduce competition, lower investment in the economy, reduce productivity and can push prices. Don’t you love your cable provider? Many states have increased the minimum wage, but that is after years of stagnant wage growth. Concentration may be bad for workers, but it generally is good for management and shareholders. Less competition equals more profits. We have only recently seen wage growth, but it is minimal. We believe the new age of monopolies, and automation could keep wages down, and with that inflation will remain tame for the time being. By The New York Times | Source: IbisWorld and Open Markets Institute; “Early 2000s” ranges from 2002 to 2007, depending on data availability. Based on our belief that inflation will remain tame, that ties into our belief that interest rates will not move much in 2019. Looking at the chart below, you will see the dramatic movement in interest rates was on the short (Fed) end. 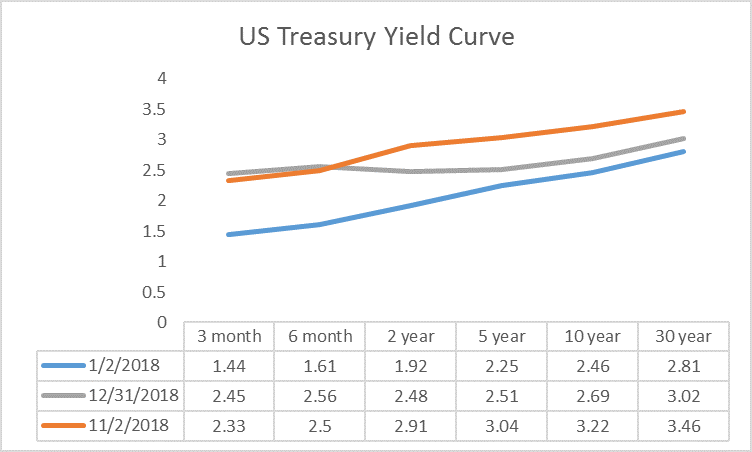 The curve in blue shows rates as we entered 2018. Up until November, rates moved up across the entire curve (orange), then we closed the year with 10 and 30 year bonds close to where they started. The grey and orange line, we believe, will be the range of interest rates for 2019. 2018 was a story of quarters. The first three quarters investors tripped over each other to buy growth and tech names. Then came the fourth quarter when the market gave up a lot of those gains. The market punished FAANG (Facebook, Amazon, Apple, Netflix and Google) in the fourth quarter. Remember when Apple was a trillion-dollar company? That was so 2018, no soup for you Apple, back to the billions. What rocked the markets? First the Fed moved rates, and Fed speak was dissected. Fed Chief Powell first stated in October that we were a “long way” from neutral. Then in November we were “not too far” from neutral. The closer we are to neutral the closer the Fed will be to ending their rate raising campaign. Today we are nearly neutral, we will possibly see one to two bumps in 2019. The US – China trade dispute was also a major disruptor. US and Chinese leaders partially diffused the situation on November 30th with their meeting in Buenos Aires. What started as words, worked its way in to the real economy as companies noted the dispute as a reason for lower earnings and lower projected earnings. Two big examples were Apple and Fed-Ex. As the chart from Ray Dalio of Bridgewater Associates shows, China has become a major player in the global economy. A few of 2018 acquaintances will not be forgotten. The trade dispute with China has yet to be resolved, but we imagine it will be completed shortly. China has made some placating gestures, and the administration will want a pre-election win. The Fed will be less of an issue as we appear to be near neutral. 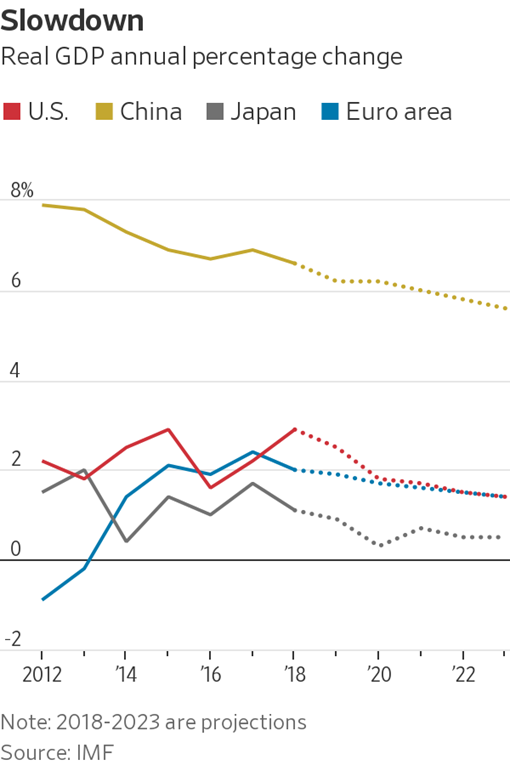 The economy is slowing, but the 4% growth rate from last spring was not sustainable. Growth should be in the 2% – 2.5% range due to tightening financial conditions, some of the tax stimulus fading and the global economy slowing. Pimco’s models are indicating a 30% chance for a recession in the next 12 months. This is certainly higher than any time over the last nine years of the expansion, but their models show no signs of overheating or overspending that generally precede recessions. The potentially messy divorce of the UK from the European Union will take place in March of this year, which will provide continued drama for markets. Finally, although we have not heard much lately, the Mueller investigation will be a talking point throughout 2019. Looking at 2019, other than the topics above, things are in place for what should be a decent market. The economy is still strong, inflation appears to be tame and interest rates should remain stable. Consumers should see a few more dollars in their pockets as tax rates are lower and lower energy prices should add to their disposable income. We adjusted your portfolios to match the themes we see in 2019. We see a rotation to more defensive companies and multinationals that generate good profits in leaner times. 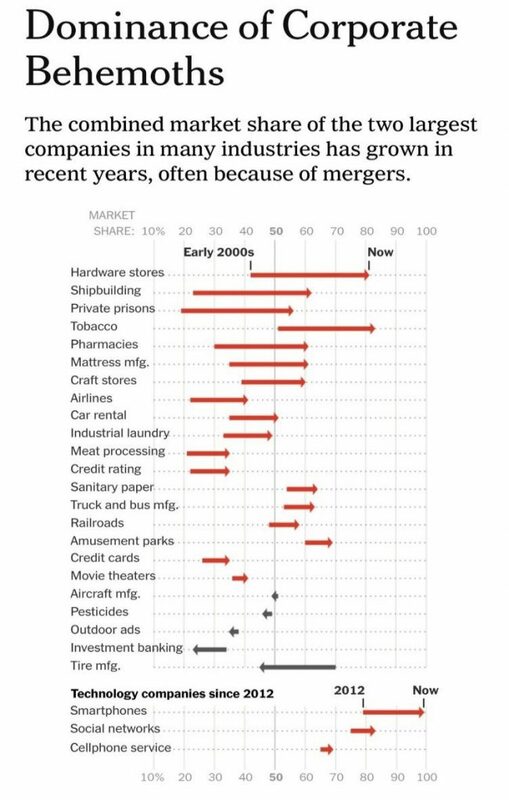 We see continued pain in tech and growth sectors. 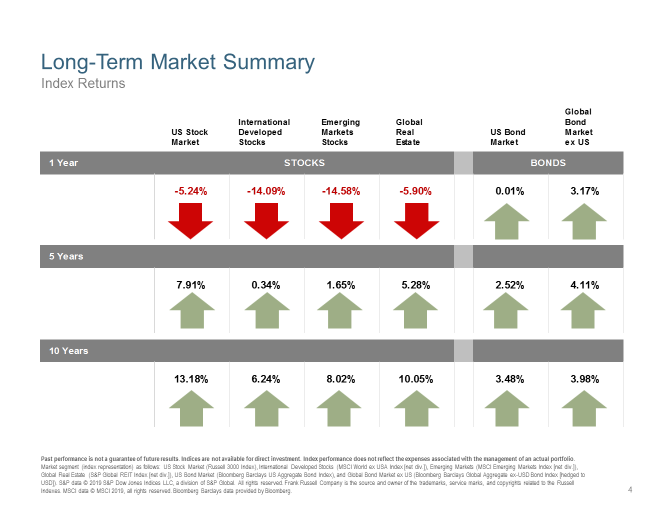 The emerging markets have been reduced in your portfolios as we see continued problems with lower commodity prices, strong dollar and tariff issues. On the fixed income side, we believe low inflation and stable rates will give bonds low single digit returns. 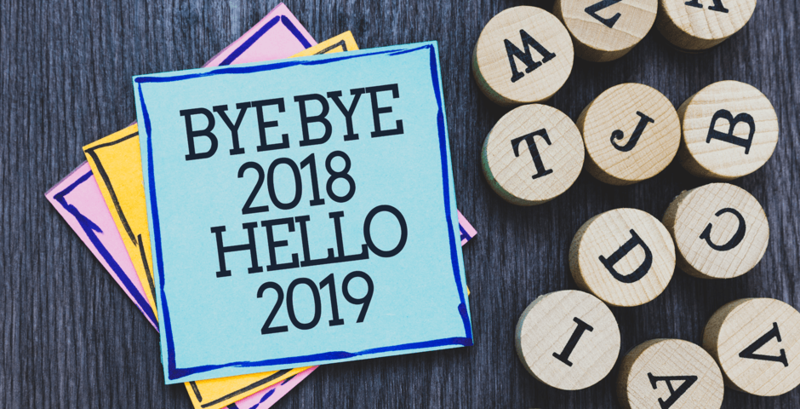 The new year is a time to review and re-assess investment plans and strategies to ensure your hard-earned money is positioned for both return and risk. Please contact us if you would like to review. PS. We anticipate tax documents being available in February. Past performance is not a guarantee of future results. Indices are not available for direct investment. Index performance does not reflect the expenses associated with the management of an actual portfolio. Market segment (index representation) as follows: US Stock Market (Russell 3000 Index), International Developed Stocks (MSCI World ex USA Index [net div. ]), Emerging Markets (MSCI Emerging Markets Index [net div. ]), Global Real Estate (S&P Global REIT Index [net div. ]), US Bond Market (Bloomberg Barclays US Aggregate Bond Index), and Global Bond Market ex US (Bloomberg Barclays Global Aggregate ex-USD Bond Index [hedged to USD]). S&P data © 2019 S&P Dow Jones Indices LLC, a division of S&P Global. All rights reserved. Frank Russell Company is the source and owner of the trademarks, service marks, and copyrights related to the Russell Indexes. 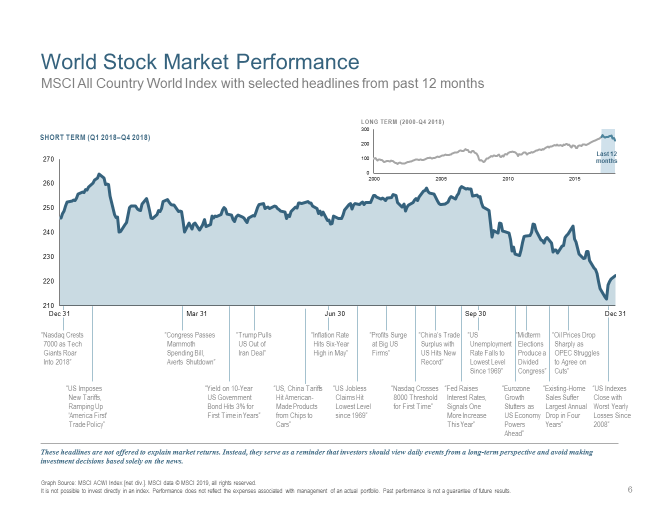 MSCI data © MSCI 2019, all rights reserved. Bloomberg Barclays data provided by Bloomberg. The S&P 500 Index is a free-float market capitalization weighted index of 500 of the largest US companies. This index is calculated on a total return basis with dividends reinvested and is not available for direct investment. Charts from Dimensional Fund Advisors. Inflation is typically defined as the change in the non-seasonally adjusted, all-items Consumer Price Index (CPI) for all urban consumers. CPI data are available from the US Bureau of Labor Statistics. Stock is the capital raised by a corporation through the issue of shares entitling holders to an ownership interest of the corporation. Treasury securities are negotiable debt issued by the United States Department of the Treasury. They are backed by the government’s full faith and credit and are exempt from state and local taxes. The indices are not available for direct investment; therefore, their performance does not reflect the expenses associated with the management of an actual portfolio. Past performance is no guarantee of future results, and there is always the risk that an investor may lose money. Diversification neither assures a profit nor guarantees against loss in a declining market. The information contained herein is based on internal research derived from various sources and does not purport to be statements of all material facts relating to the securities mentioned. The information contained herein, while not guaranteed as to the accuracy or completeness, has been obtained from sources we believe to be reliable. Opinions expressed herein are subject to change without notice.